(Nanowerk News) Scientists from ETH Zurich have succeeded in solving a key problem in materials research: they have developed a procedure with which they can measure the contact angle of a nanoparticle as small as ten nanometres at the interface between two liquids. 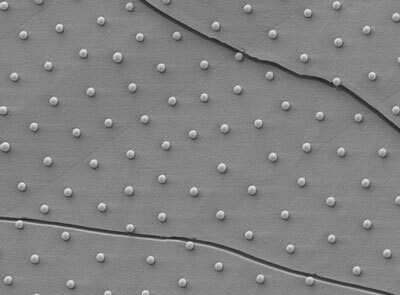 "Knowing this contact angle is essential for the production of new materials using the interface as a 'template'," says Lucio Isa, a postdoc at the Laboratory of Surface Science and Technology and first author of the study published in Nature Communications ("Measuring single-nanoparticle wetting properties by freeze-fracture shadow-casting cryo-scanning electron microscopy"). The contact angle contains all the important information on the behaviour of the nanoparticles and therefore determines the structure of the new material. Its knowledge will thus enable the scientists to achieve optimal control on the fabrication of materials with desired properties. In their research, the scientists study layers of water and oil-like substances in contact with each other, so called liquid or fluid interfaces. They then place at such fluid interfaces hydrophilic (water-loving) and hydrophobic (oil-loving) nanoparticles that are up to 5000 times smaller than the diameter of a human hair. The deeper the particles dip into the water, the smaller their contact angle. Using traditional imaging methods, however, until now it was not possible to measure such contact angles directly for individual nanoparticles smaller than 500 nanometres. "On this scale, light begins to interfere with the sample and electron microscopy becomes necessary," explains Roger Wepf, Head of ETH Zurich's Electron Microscopy Centre. To date, the contact angle of very small nanoparticles could only be measured indirectly with other methods, often imposing strong approximations or requiring chemical modifications to the system. During a brain storming, Wepf gave Isa the idea of using a classical, purely physical procedure to measure contact angles: the so-called freeze-fracture technique, which has mainly been used by biologists during the last fifteen years. They use it to freeze samples within microseconds and the fracture them to study the internal structure of cells under a cryo-scanning electron microscope. Isa and his team have now extended the freeze-fracture technique to freeze nanoparticle-laden interfaces and fracture them to expose the nanoparticles. Upon fracture, the interface opens as a book and, as a result, the nanoparticles stick out from the frozen interface and leave a hollow print on the opposite side. The particles are then coated with a thin (one to three nanometres) metal layer at an oblique angle. The metal coating makes the nanoparticles visible in the cryogenic scanning electron microscope and then the scientists can accurately measure their size and distance between one another. The oblique coating angle casts a shadow behind each particle, similarly to a sundial. By measuring the length of the shadow it is possible to obtain the height of the particles relative to the interface, which in turn determines their contact angle. Knowing the contact angle makes it possible for the scientists to calculate how much space each particle takes up at the interface, which determines how much energy is used to hold the particles there. Among other things, this information is important in our everyday life for the production of emulsions in which fats and liquids are processed together ? such as in ointments, creams or mayonnaise, where small proteins take over the role of the nanoparticles and stabilise the emulsion. "If you pour oil and vinegar together, mix them and then go and make a phone call, they will have separated again by the time you come back," explains Isa. But if you mix in pepper, the pepper powder occupies the interface between vinegar and oil and thus stabilises the emulsion. Isa highlights the new and attractive possibilities that this method opens up in medicine ? such as in the research on "nano-medicine transporters", which are to be used to deliver medication straight into tumour cells. However, Isa's passion is classical materials research: "For me, it is extremely important to understand the fundamental behaviour of nanoparticles at liquid interfaces and how we can use them to produce materials with new and exciting properties." According to the researchers the measurements show that contact angles can vary significantly between nanoparticles of the same kind. Controlling these variations will allow nano-materials with much better defined properties to be produced in the future.